The junior lithium sector got a new valuation benchmark at the end of May when Aussie-listed Galaxy Resources (GXY-ASX) sold some grassroots lithium assets in northern Argentina to POSCO, a Korean conglomerate. The ground was in the northern basin at Sal de Vida, in northern Argentina, and Galaxy received US$280 million cash. The package consists of a JORC-compliant total resource of 2.54 million tonnes of Lithium Carbonate Equivalent (LCE), of which 1.58mt was in the measured and indicated (M&I) categories (JORC is roughly the Aussie equivalent of a Canadian 43-101 report). M&I stage assets have had a lot of work done on them; these are not pie-in-the-sky initial resource numbers. The Market takes this stage of resource development a lot more seriously. That’s a valuation of roughly US$177 EV/t of M&I LCE, where EV=Enterprise Value (market cap + debt). On a total resource basis, it works out to US$110/t, or at a simple exchange rate of $1.30, about CAD$148/t. Here’s a table that shows how several leading lithium juniors line up against this valuation. Of those that have at least an initial resource, Advantage Lithium (AAL-TSXv) is among the cheapest. This table also shows how valuations move up as the resource becomes more secure—with a PEA, or Preliminary Economic Assessment, and then again more value once construction is underway. 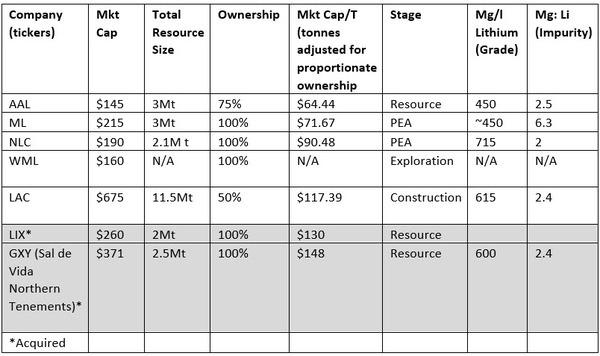 The two most recent transactions in the lithium space were done at the resource stage, (see bottom two rows in chart), and were at valuations almost double what the current crop of juniors is trading for. Despite the Market’s concern of an increase in lithium supply in early 2019–which has kept lithium stocks down–the industry continues to buy up assets at high valuations. All of this makes me think the EV Trade–Electric Vehicles–for junior lithium and cobalt stocks will see much better days this year. The Street was surprised by the high value of this transaction. This asset was not one of Galaxy’s core assets. To me this is a very telling comment—Hartleys is saying that to the finance community, this ground was essentially worthless, but it was worth US$280 million to the industry players. That should speak volumes to lithium investors. The industry thinks this is a bull market and is willing to pay Big Money for what appears to be Tier II assets. Another Aussie firm, Bell Potter, said POSCO paid such a high price because “of what we understand is a more unconventional brine project that incorporates its own proprietary technology rather than the usual brine evaporation process being adopted by GXY for SDV.” SDV being the Sal de Vida asset. Chemistry is important in sourcing lithium. Let’s go back to Advantage Lithium for a moment. 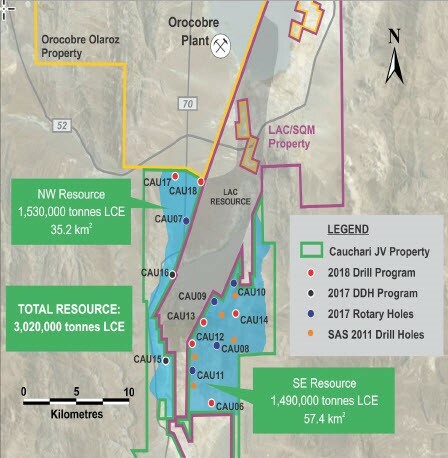 Their drilling has shown they have a very similar asset as LAC, which is Cauchari in the same Lithium Triangle. Advantage and partner Orocobre have the ground on both sides of LAC’s Cauchari-Olaroz project…which is in the construction phase. Advantage’s drill results show they have similar grade, arguably a fraction lower. And they have the biggest catalyst in their history coming in just one month’s time: their PEA, or Preliminary Economic Assessment. As you can see from the “comp” (for comparables) chart above, that indicates the Market is willing to bump a company’s value when that happens. It works out to a 40% bump for Advantage with the PEA in hand, and nearly a double in valuation once construction starts. With PEA in hand, management will go out to the industry—from the upstream players like SQM, FMC, Albemarle, Orocobre et al—to the downstream players like POSCO/Tesla/Ganfeng/Toyota—the list goes on (these four are just the most recent downstream players to do deals with small upstream lithium manufacturers…just to secure supply) to secure construction financing. Management is quite hopeful that will result in non-dilutive capital. The goal is to get the industry supply chain to pay up just to secure supply–in an area with great infrastructure already, and supportive governments. These latest lithium transactions–one just over a week ago–helps the Market value the many junior lithium stocks. The industry is clearly more bullish than investors right now. But with the lowest valuation in its peer group at the moment, a clear near-term catalyst in place and a large resource, Advantage could be the first to move up the ladder and see gains for investors. Next post: Are You Still Looking for Oil Stocks in the Wrong Places? Previous post: This Permian Producer is HAPPY About Huge Discounts…How Strange is That?